Can I be excited? 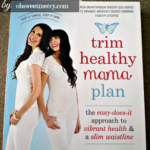 My Dark Chocolate Coconut Cake in a Mug recipe was included in the NEW Trim Healthy Mama Cookbook! You’ll find it on page 293. When you think diet, what comes to your mind? Deprivation? Like, all the things you can’t eat anymore? Pizza. Cake. Cookies. Chocolate. Ice cream. 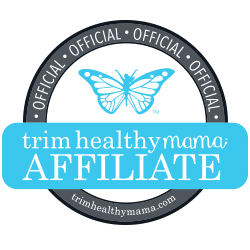 That’s one thing I love about Trim Healthy Mama. If I want cake, I can have it – generally whenever I want – as long as I’m following the plan guidelines. Same goes for pizza, cookies, chocolate, ice cream, and many other of my favorite foods. 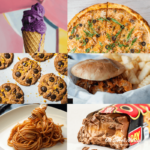 Who wants to give up comfort food? This past week was a tough one for me. I don’t do DST well. I hate it…like God hates sin. It makes me cranky and miserable. So, I needed some comfort food. And what I wanted was a decadent, dark chocolate cake. I didn’t want to have to wait around for it. I wanted just enough to satisfy me, not a whole cake to tempt me to eat the whole thing. And I wanted it topped with cream cheese frosting. A tall order, you say? No problem! 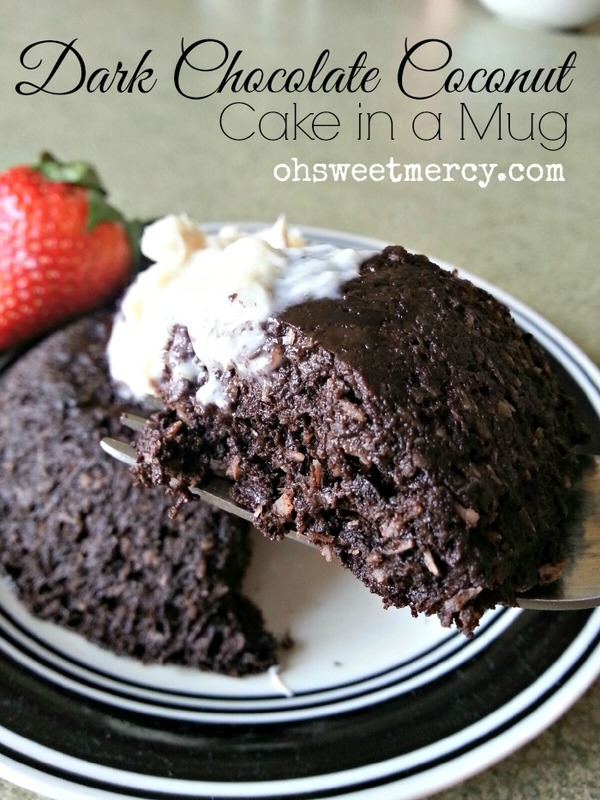 Trim Healthy Mama says make a Cake in a Mug! How’s that for a wonderful way to eat? Not to mention the shrinking side effect. I love that part! I need to do another update post, but here’s a recent picture, plus where I started for comparison. 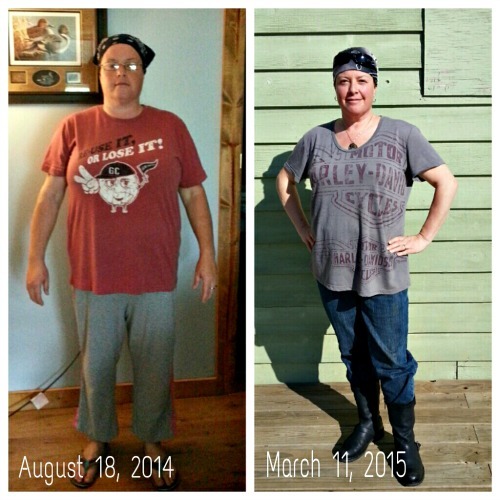 I woke up the next day two pounds lighter, with a total loss of 40 pounds since last year! I had lost 10 pounds just prior to starting THM, so 30 of that was all thanks to Trim Healthy Mama. And I eat cake often, actually. I’m about 25 pounds from my goal weight now. A light at the end of the tunnel! I love getting creative with my THM menu! So I went to the kitchen and whipped up this yummy cake in a mug in no time flat. Since I love coconut, I wanted to incorporate that into my dark chocolate cake in a mug loveliness. But, often baked goods with coconut turn out dry. On a hunch, I decided to try adding a li’l something and it turned out just like I wanted, dark…chocolatey…moist…just a hint of coconut. learn about TwoGrand here…then sign up and come find me! I use equal parts of butter and cream cheese…I think. I eyeball it. Then a splash of vanilla and some stevia. Mix it all up until it’s fluffy or at least well mixed. I always just use a spoon or fork and mash it all together and stir it until it’s smooth and creamy. I saw someone on YouFood that makes up a bunch of cream cheese “frosting” and keeps it in a mason jar in the fridge. I don’t think I have the self control to stay out of it if I did that, so I just make it as I need it. This Dark Chocolate Coconut Cake recipe in the THM cookbook has a light glaze that you can also try instead when you want a bit lighter dessert. Too much cream cheese and Heavy S foods can be the culprit behind stubborn stalls! Eat the cake and leave the guilt behind! 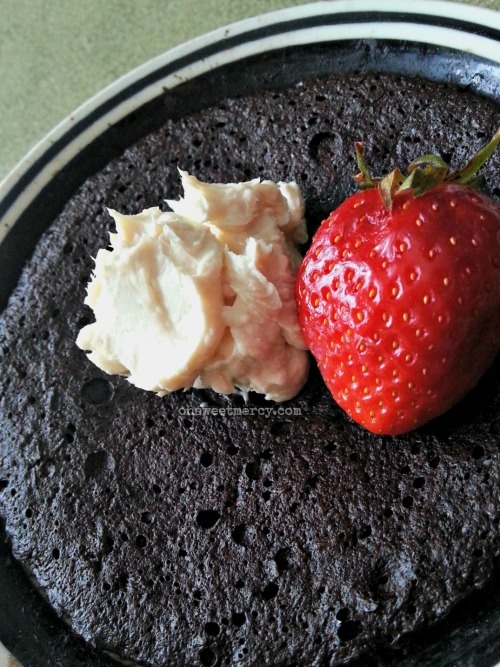 Serve this Dark Chocolate Coconut Cake in a Mug topped with cream cheese frosting and a fresh strawberry, if you like. Then, have your cake and eat it too. ‘Cause it’s totally on plan. Don’t Forget to Pin this Dark Chocolate Coconut Cake in a Mug Recipe to Your Favorite Boards! Craving chocolate? On a low carb diet? This easy Dark Chocolate Coconut Cake in a Mug recipe will give you the chocolate decadence you crave without blowing your healthy eating plan! Sugar and grain free, quick to make! And, you'll find this recipe in the Trim Healthy Mama Cookbook on page 293! Microwave for one to one and a half minutes or until cooked through. Frost or glaze and enjoy! I love that this version does not contain any almond flour! That stuff is so expensive anyway, and I love coconut! I never buy Yogurt anymore, but I always have sour cream on hand, so I will use that instead. Thank you! Hi Shannon! Thanks so much for stopping by, and I sure appreciate your comment 🙂 I don’t use a lot of almond flour – it’s expensive and too many nuts can slow weight loss. I’ve got a 43 yr old metabolism to contend with so this version works better for me too. I plan on making this tonight but just realized I don’t have yogurt and planned on using sour cream…good call! I found you! I’m mulberry from Two Grand! I saw this on Jennifer’s page on FB. Going to give your cake a try, although my husband won’t like it dark, so I will use the other for his! Well hi there Mullberry! Glad to see you here, love to connect with people from TG outside of the app 🙂 hope you like it as well as I do! Thanks for stopping by and saying hi! I made it with sour cream last night and it was great! I’d love to try it with coconut cream, thanks for the great idea! This cake looks amazing! However,we dont use microwaves…can I use the convention oven instead? Ho Daniela! Yes you sure can. I’ll have to double check on oven directions but I think 350 degrees for 8-12 minutes. I LOVE this recipe!!!! I will be making this tonight for our dessert. I just got some new MIM baking mugs to make them in too!! Thank you for sharing your wonderful recipe!! Hi there Evelyn Rae! Thanks for stopping by and commenting! I hope you enjoy it in your new baking mugs! Hi charity! I’m do glad you liked it, and thank you for the kind comment! How do I find the diet plan your following?! 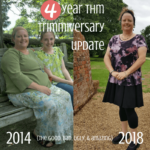 Be sure to join the Trim Healthy Mama group(s) on Facebook if you’re on there. Lots of great support! This was very timely. I helped my Granddaughter make her 10 year-old Birthday cake last night. This recipe will let me participate and indulge in my own chocolatey yumminess without going off plan. Thanks for sharing. Marion I sure know what you mean! 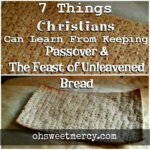 Being prepared for those situations where everyone else is eating “normal” food is one way to keep on plan and avoid temptation. Happy birthday to your granddaughter and I hope you had a great time! Hmmm…I’ve not had that happen. My only thoughts would be maybe the mug is too small? Perhaps try it in a bowl. Or that there is something in the Bailey’s (which sounds amazing!) that reacts with the baking powder? That is a bummer, I’m sorry that happened! I just made this and it is delicious!! Thank you! Thanks for stopping by Charity and I’m duo glad you liked it! I am eating it right now. It’s fantastic! I love the cake texture too. Thanks for the recipe. Love it! Thanks Lorinda! I’m so glad you liked it! I’m so impressed with you that I added your site to my start menu so I don’t lose it and so that I can come back and get more help, tips and ideas from you when I have more time. btw, I need lots of help with my 60 year old metabolism. Argh! Thanks for the help! Vicki, thank you so much for your encouraging comment! There are so many great blogs out there I often wonder if my little presence makes a difference. I so appreciate that you took the time to check out my blog and even added my site to your start menu. I hope I can help and encourage you! i subbed 1/2 t. Of Bailey’s Salted Caramel ( a St. Patrick’s Day treat:) for the vanilla. Both of my MIMs ran over the mug and kind of exploded! I’ve never had this happen before! Any guesses as th why this would happen? Mine also tried to bubble over. When I cook my eggs in the mug it will do the same thing. I just open the microwave door to pause cooking until it sinks back down, then restart the rest of my seconds. I had to do this several times. I could tell it was cooked through because it stopped trying to make my cup runneth over! I can’t say I have that much trouble with mug mugs and cakes bubbling over, but your trick sounds great. You could also try a bigger mug or use a bowl or small baking dish, too! I made this without coconut, since I didn’t have any on hand, it was delish. I was scanning the comments to see if anyone omitted the coconut since I don’t care for shredded coconut. Glad you posted your comment! Now, I’m pinning this to save for tomorrow. It’s been a while since I’ve made a ‘cake in the mug’ because I wanted one without almond flour. I got burnt out. :). Dawn, this is amazingly delicious!!! I am a huge chocolate fan and the coconut made it even more yumalicious! Got my morning off to a happy start! 🙂 Definitely a favorite of mine now! Thanks so much for sharing! Just finished this. It is amazing!!! Hi there! I’m new to this site and was checking out your recipe! Sounds interesting (lots of positive feedback!) but was wondering about the face there is no kind of almond, coconut or flax meal/flours in here… Is this more of a soufflé type of dish? If so, COOL! Hi Cristal! Sorry for taking so long to get back to you, life has just been happening for a while! This is not like a souffle, it is like a cake. The cocoa powder acts like a flour and the finely shredded coconut also helps give it a cake-like texture. Which is fabulous for the low-carber who wants cake! Hope you like it! Holy moley! I’m just pinning away on your site and WOAH! That’s incredibly motivating to see such a difference! You look so much healthier! Keep up the great work momma!! Hi Honey! Thanks so much for pinning away and for your kind words 🙂 Now that I’m back from my trip I’m finding myself not as motivated to stick to the plan and exercise…sigh. My one year “trimmaversary” is coming up and I need to get back at it! I don’t want to undo all that I’ve done in the last year! Just discovered your recipe. Didn’t have yogurt, so I used ricotta cheese. Worked out great! I can’t believe how low the calories and carbs are in this recipe. Instead of putting icing on it I just sprinkled it with a little extra Swerve. That’s a great substitute idea, thanks for sharing! I’ve never cared for ricotta cheese so never have it on hand myself. You could also use sour cream as well. Thanks for stopping by! satisfied my sweet tooth…thank you! Just made this and its super eggy and left a nasty taste in my mouth, making me want to eat a bowl of ice cream to make it go away! There are so many positive comments here but the recipe is so simple I’m not sure how I could have gone wrong. I’ve never made any kind of cake since starting thm. Is this how they all turn out? I sure hope not. It smells fantastic and looks good but the egginess I just can’t get over. Too bad ? I’m so sorry you didn’t like this recipe. Since you’re new to THM baking, it can take some time for your taste buds to adjust. One thing you can try when making any mug cake or muffin is to use all egg whites instead of a whole egg – it’s the yolk that imparts that “eggy” flavor. I love eggs, but I don’t always enjoy something tasting “eggy” either so I know what you mean! I hope you’ll try again one more time with my suggestion and let me know if that helped! If you use carton egg whites, I think it’s 3 tablespoons that equals one whole egg. If I was using fresh eggs, I’d use the whites of two eggs. Just found your site and this yummy recipe. Made it with 0%Greek yogurt and truvia. Had no coconut but when it was done it was delish! Great texture. Took the full 90 seconds .Just happened to have some whipped cream on hand too. Totally didn’t hurt it at all! I’m so glad you liked this recipe…it’s definitely one of my favorites! And yes, a little whipped cream never hurts 😉 Thanks for stopping by and sharing! No flour of any kind??? Or did I miss it? No, you did not miss a thing. This is a completely flourless recipe, perfect for those who can’t have grains or those following low carb diets or Trim Healthy Mama. The cocoa powder is flour-like, and works wonderfully well! Yum! Thank you for this recipe! I found it on Pinterest and then discovered you! I love your site! I will be following you as time allows. I can’t wait to try your flatbread recipe. I’m new to THM and am fumbling my through trying to figure it out. So far so good but don’t ask me to explain the different meal types cuz I can’t keep them straight yet. The good news is I feel good and am determined to make this my lifestyle of eating. People like you are a tremendous help! Thank you. I didn’t see the cream cheese frosting at first so I used whipped cream I made from coconut milk, cinnamon and vanilla. That went well with the cake. The cake was so filling I couldn’t finish it. A miracle for me not to scarf every morsel. 🙂 You’re my new best friend just so you know. You’ll be hearing more from me…lucky you! ? Have a blessed day! Aw thanks so much Amy! I sure love hearing that my recipes are helpful, especially for new THMs. It can be a bit overwhelming at first, trying to figure things out! Whipped cream sounds like a fabulous topping for this cake, good for you to think of that (and thanks for sharing that idea!). Happy to have a new friend in this journey, thanks so much for being a fan! This was delicious!!! Best mug cake I’ve tried! Hi Blair, so glad to hear you liked it! Thanks so much for stopping by and letting me know, I sure appreciate it! I just made this cake for breakfast with the topping on pg 293 and it is amazing! I topped with some strawberries and a few blueberries. Thanks Ray! Berries sound like a perfect complement to this cake!